For most of us watch freaks, big part of the fun is in the mechanical movement. Handwound or automatic, doesn’t matter, as long as it has a mechanical heartbeat instead of a battery operated electronic circuit (exceptions aside). Most brands use movements built by companies such as ETA, Soprod, Lemania etc. Other companies, the so-called in-house manufacturers, develop and produces their own movements. Sometimes, they even let other watch brands use their movements (like Jaeger-LeCoultre for example, Piaget or Girard-Perregaux and there are much more examples from the past). Besides functionality, complications or materials used, what (can) make them special or even stand-out, is the level of decoration of the mechanical movement. We all know that Patek Philippe does an outstanding job and even applies a superb level of finish to those parts you will never see when looking at the movement. Hiding under a bridge, rotor or whatever part… you know that Patek Philippe took care of those parts as well as the visible parts. We also know that – let’s say – watches under 1000 euro (or USD, as you wish) can’t possibly have the same movement decoration as an Audemars Piguet almost ten times that amount of money. Not because the lower-end mechanical watches don’t want to, but simply because the spent hours and watchmaking competences will cost them too much money and in the end, you will have to pay for them. It is just a concession, and perhaps THE concession, you have to make when opting for a watch from a lower segment. This perhaps explains why there is so much price difference in an IWC Flieger chronograph that uses a modified ETA/Valjoux 7750 movement and a Sinn 356 Flieger. Engraving: As simple as it sounds, it isn’t. Engraving is decoration done by either hand or machine, creating in relief or by hollowing, just like the family weapons and wording in the rotor of the AP movement as pictured above. It takes – ofcourse – a steady hand and in depth knowledge of drawing techniques. Cotes de Geneve: Engraving shouldn’t be confused for other techniques used to create nice decorative striping or stippling. 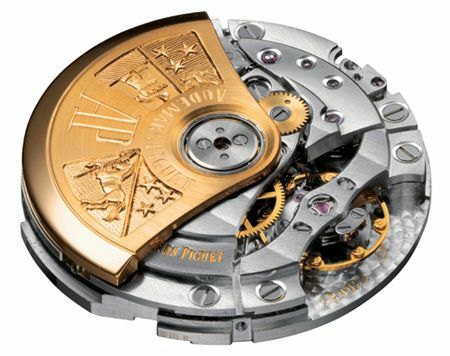 The most famous decorative technique for watches, besides engraving, is probably Cotes de Geneve. As you can see on the movement pictured above, the bridge and other middle parts are decorated by these regular parallel wave-like lines. This type of decoration is mostly used on the visible surface of bridges and bars and should be impeccable. Stippling: I mentioned stippling already, and you probably guessed already by looking at the overlapping small circles on plate of the movement, just below the balance. Stippling (or spotting) is decoration that is quite expensive to have performed, since the circular-graining machines are still very rare and expensive. If you want to read more about movement decoration (since I haven’t mentioned snailing, Perlage or Engine Turning), I suggest you visit The Montres Suisses blog. Also, the Fondation de la Haute Horlogerie has a great Fine Watchmaking Glossary section. I hope that this at least will give a better understanding in why an ETA 2892-A2, Valjoux 7750, Soprod or other ‘commodity’-movement doesn’t always have to be commodity.